This newly built one level, 3 bed/2 bath/2 stall garage and open concept home features a master with on-suite luxury bathroom and walk-in closet, plenty of storage and 3 zoned slab heat all in a coveted location next to the Mesaba Country Club. Select to final furnishings and have your dream home finished before closing for just $259,900! OR purchase unfinished at $229,900! $100/month covers lawn care, snow removal and building insurance. Call for more information on this unique opportunity. Information Deemed Reliable But Not Guaranteed. All properties are subject to prior sale, change or withdrawal. 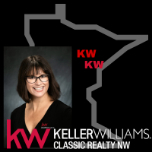 Neither listing broker(s) nor Keller Williams Realty Brainerd Lakes shall be responsible for any typographical errors, misinformation, misprints and shall be held totally harmless.